These affordable Demountable Liquid Cells are excellent for examining mulls, injected liquids and flowing liquids via transmission spectroscopy. These cells combine our time-tested leak-free design with an all-PTFE cell body for superior chemical resistance. 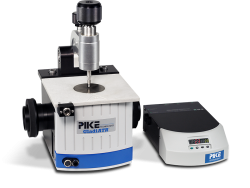 The model with Luer Lok fittings is perfect for examining mulls and injected liquids under static conditions. 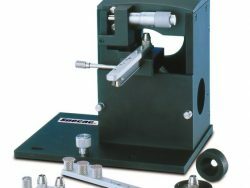 With the flangeless fittings models, it is simple and straightforward to flow liquids through the transmission cell for applications such as oil analysis. Both cells feature easily variable pathlengths. 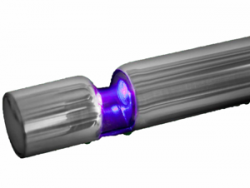 The DLC2™ is ideal for infrared transmission measurements of liquids, mulls, and smears. It is also excellent for process control and laboratory applications. Variable pathlength from 25µm to 500µm. Disassembles easily for cleaning and window replacement. Two ports for static or flow applications. 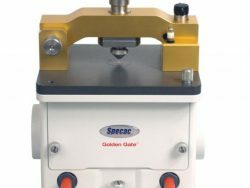 Sample slide plate mounted for easy installation in FTIR spectrometers. Chemically resistant PTFE cell body and fittings. Static transmission cell with Luer Lok fittings. Flow transmission cell with flangeless fittings for 1/8″ or 1/16″ tubing. Operable to 1.4MPa (200 psi) with the appropriate windows. 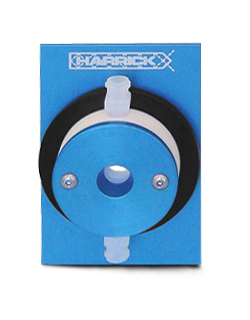 Optional spacers available to extend the pathlength range from 6µm to 1mm. PTFE cell with Luer Lok or flangeless fittings. Six PTFE pathlength spacers: 25, 56, 100, 150, 250 and 500µm.